They seem to work fine. They distort a little - 0.87% THD @ 3.8 Vpp 1kHz but even 100 Hz is under 1% as well. I would love to hear them in a track but that's kinda hard without damping and banana jacks. Would it be considered a sin to install bantam jacks in place of the bananas? I would need to modify the backing panel of the front panel a little. So 4 of the banana jacks would be replaced with bantam jacks by slightly enlarging the holes but then also adding holes with countersinks for the bantam jack screws (to the backing panel - the outer panel would not be modified in any way). The other 4 holes would be pushbuttons and a toggle performing various bypass, circuit splitting and damping functions. The outer panel holes are ~0.56" so C&K F Series pushbuttons should fit perfectly without modifying the outer panel. Aside from the obvious connectivity benefits it seems to me the circuit can be driven differentially. Meaning I don't really need transformers. Right? Also, I would be able to ground the chassis. As is it's not and SNR goes up to 99dB if I ground it. So does this sound like a good plan? Actually these are variable inductor, not variable capacitor. 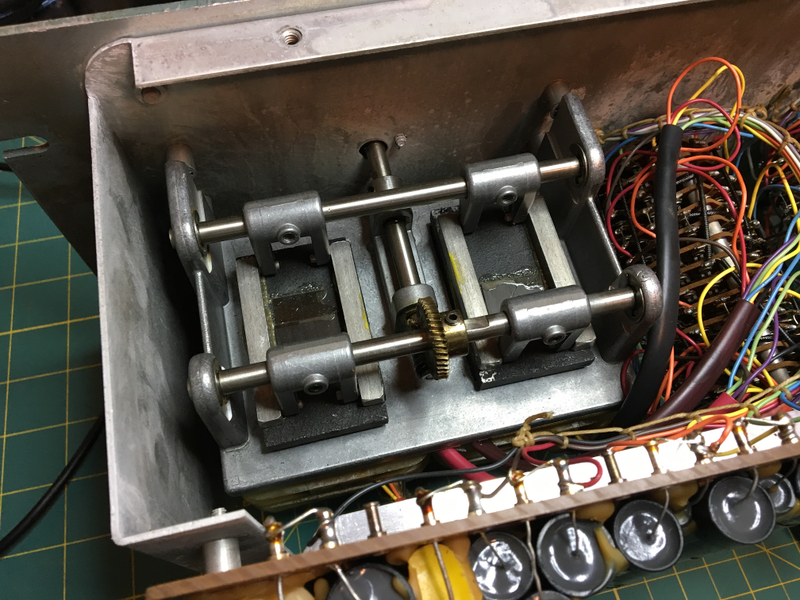 When you turn the "multiplier" knob clockwise, it lowers down what looks like some kind of ferrite block which increases inductance. By quite a lot actually. The range controls switch capacitors. At the variable control extremes, the response does develop a broad 2-3dB ripple. Presumably that is because it will only be perfectly flat at a particular inductance for a given capacitance. Anywhere near 1x and it's perfectly flat. But the variable adjust is actually greater than what the knobs read. The knobs read 0.8 to 1.2 but turns way beyond that in both directions. In the 300Hz range setting the actual measured full range adjustment is from 0.6x to 3.2x. Meaning you can variable adjust from say 150 Hz all the way up to 800 Hz (at the 300 Hz range setting). That's over 5.3x! At higher frequencies the range is 0.8x to 2.1x but only over the extreme positions which means the dial values become less accurate as you switch to higher frequencies. Meaning at the 9600 Hz setting, to get 2.1x you have to adjust beyond 2.1x on the dial to as far as the knob will go. But regarding ripple, there's enough overlap that you can just switch to the next range to keep the "multiplier" control away from extremes and thus mostly avoid pass band ripple. Note that the slope is 30dB per octave with a pretty sharp knee. I could see how this might be used to create separation between instruments that are similar like guitar and bass. Meaning you can cut everything below the low note of some guitar riff to leave room for bass. Yes, the mechanism made me think...could the same thing be done with capacitance nowadays while retaining the sonics of polys? Note that the slope is 30dB per octave with a pretty sharp knee. I don't think there would be "issues" necessarily. But yes, there is massive phase shifting with such steep filters. But I don't know of a lot of scenarios where it would really be a problem. I did read that thread but not intently. My feeling is that it would only be an issue if you tried to mix two signals that were correlated where one was filtered and the other wasn't. 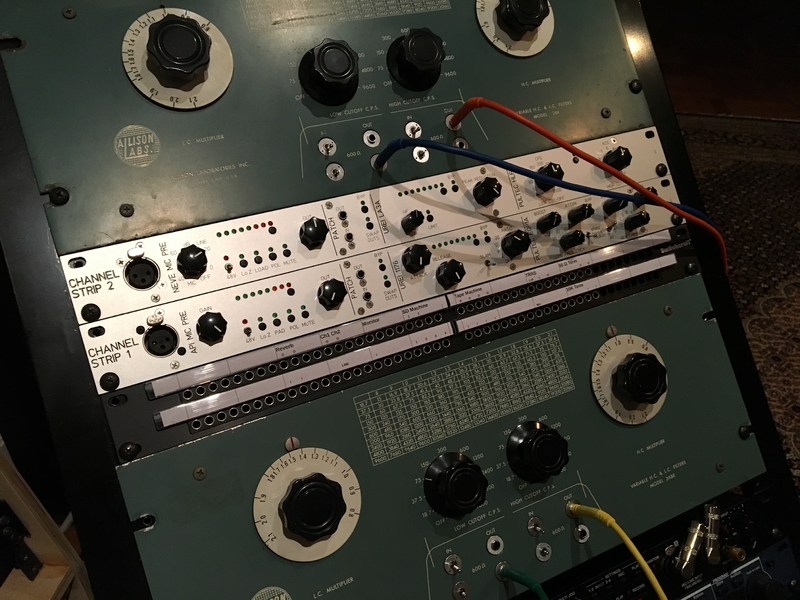 For example, if you have two mics on the same instrument and you filter one but not the other and then tried to mix those signals together. That would be a disaster. With both low and high cut, phase shift within the pass band with 30dB/oct filtering is 400+ degrees. But I just wouldn't use it that way. And that sort of thing can happen in other ways. For example, if you have a digital mixer and you use an send / return or aux / return, round trip conversion is going to be ~5ms which would be like a 2000 degree phase shift. But you don't hear people complain much about that because again, it's only a problem with highly correlated signals. I've got one of these, they're fun! Just make adapter cables from Banana to whatever you need, less work than modifying the case. +1. If there is a collector value, it should stay original. phase shift is built into most software filters too. Not a special issue here. I'm for keeping most things original, but swapping connectors on this won't hurt value. They do not appear to be collector items no. They look cool. But for whatever reason, they're not commanding high prices. The problem with just making adapter cables is that there MUST be damping resistors. I rigged up some pots just to play around while listening to music and it really only sounds good critically dampend. Otherwise, it sounds like a wah pedal. I have completely abandoned the idea of adding "resonance" pots. Currently the plan is to NOT drill into the outer skin front or back. I can remove the banana jacks and use the existing 8 holes which are ~0.56". They I'll install 4 bantam / tt jacks and 4 C&K F series pushbutton switches. 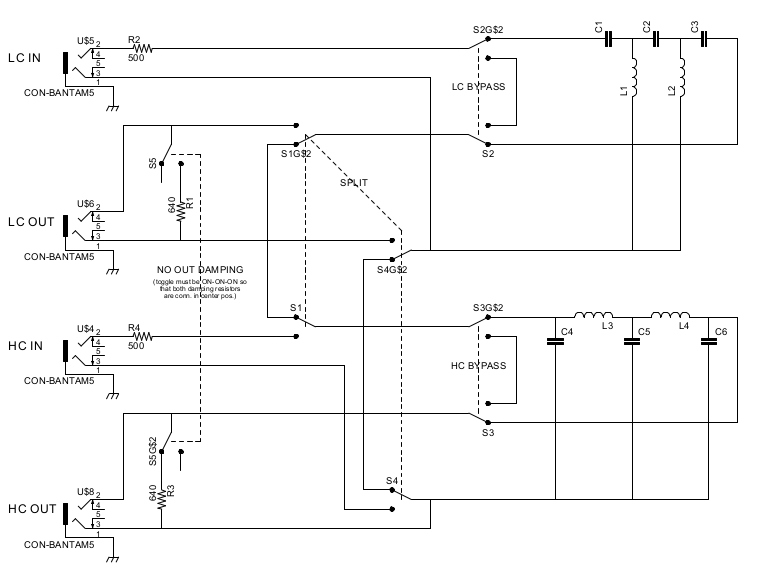 Two switches for bypassing each of the separate filters, one for linking the two into one filter and one for disconnecting / bypassing the damping resistors (so that it can be made to work with older gear that is 600 ohms like say the 1176 ). 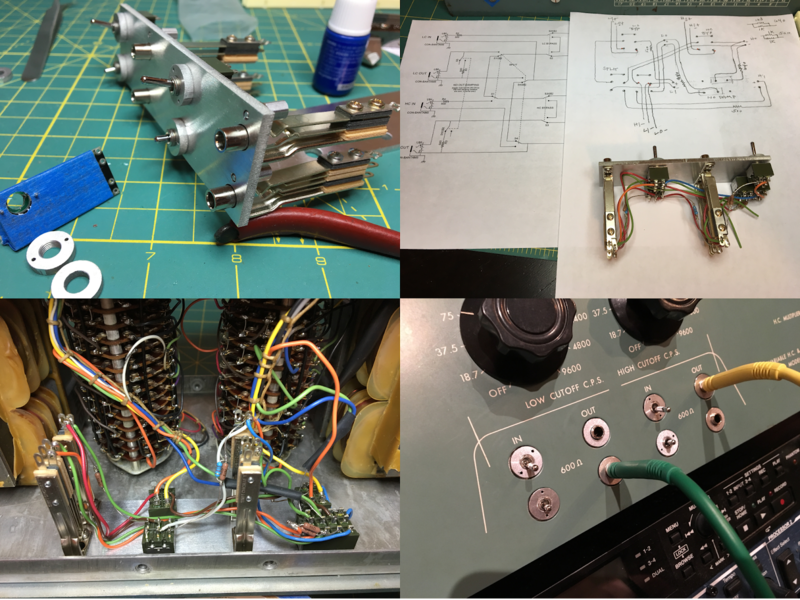 After much figuring, I have decided on 500 ohms series and 640 ohms load damping resistors. 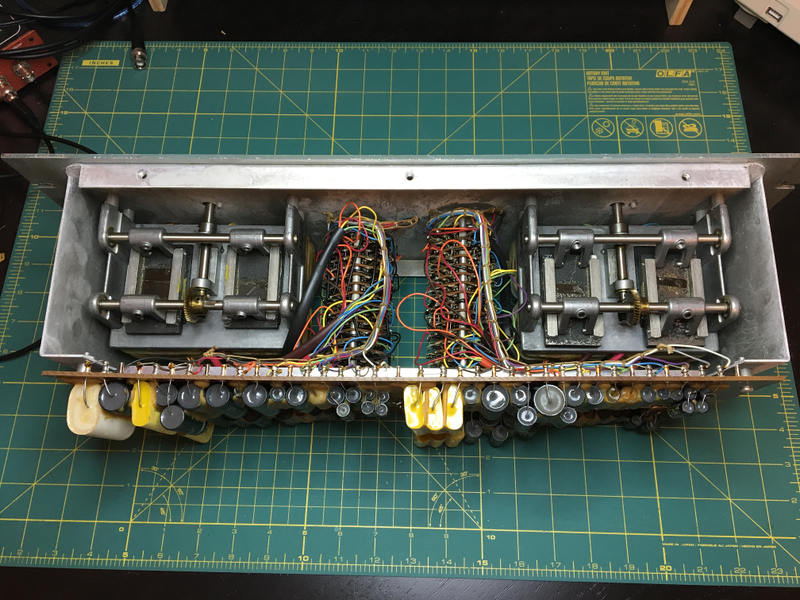 However, there is an inner backing front panel that I would need to modify to enlarge the 8 holes (1/4" for the bantams and 1/2" for the pushbuttons). I think that's a decent compromise. If for some reason these two turned out be the secret weapon used on Dylan albums, someone could fix or replace the backing panel and restore it completely original. 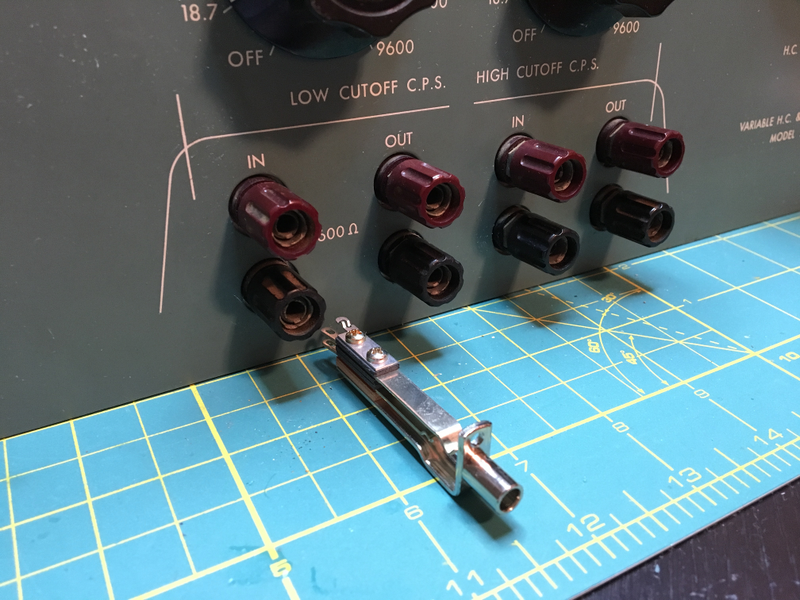 Actually only the older 1176 models with the bridged T attenuator look like 600 ohms. But even those look like the output is lower. Later revsions are 10K in and low-Z out like most stuff today. 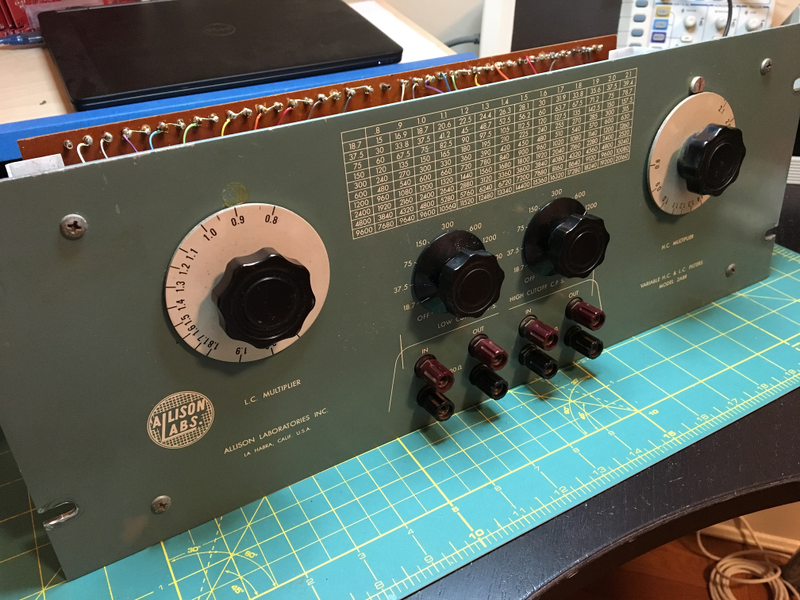 The Spencer-Kennedy is more like the Krohn-Hite and General Radio, 4 ganged pots change the values, and an active circuit. Apparently this general idea was widely available with different variants. Here is a Krohn-Hite box from 1952. Finished and racked as shown in pics at the end of the first post.